Should we be polite in our criticism of science ? Why is criticism of newer scientific technologies always frowned upon or rather considered indecent ? In science you don’t require politeness , we only require correctness.This is especially true in medical sciences. But this is easier said than practiced in the scientific community . In any scientific conferences the only a couple of minutes or few lines are allotted for the customary negative issues and the limitations of the study. Unscrutinised science can no longer be called as science ! it can only be termed as pseudo science! It is believed skepticism is a powerful dampener for the scientific growth.May be it was true in the earlier era of pre industrial world. But those days science was growing only with passion for discovery and an un contaminated mind.But now too many conflicts have cropped in. What is positive thinking ? and What is negative thinking in science ? What is herd behavior ? It is a behavioral pattern where in animals and humans in large numbers , tend to behave in the same way at the same time without application of mind . Herd behaviour in animals and human how they are different ? A group of animals fleeing a predator shows the nature of herd behavior. In the often cited article “Geometry For The Selfish Herd,” evolutionary biologist W. D. Hamilton said each individual group member reduces the danger to itself by moving as close as possible to the center of the fleeing group. 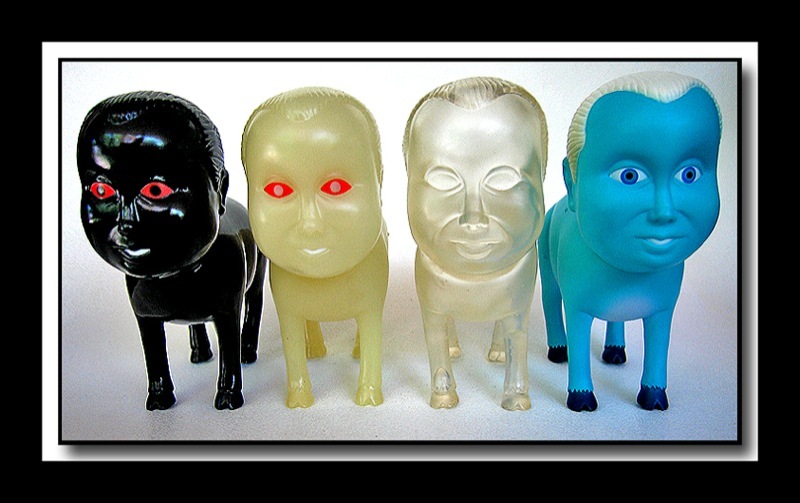 Thus the herd appears to act as a unit in moving together, but its function emerges from the uncoordinated behavior of self-seeking individuals. Among humans for example when panicked individuals confined to a room with two equal and equidistant exits, a majority will favor one exit while the minority will favor the other. The practicing habits of medical professionals move , symmetrically as a herd . When a top journal or a opinion leader utters something every one tend to move in that direction . If a herd leader says a particular treatment is great, every one will say yes . If he says nay every one will say nay ! No one will really question the direction they move ? Unless the correction occurs from within the herd. No external forces usually are effective.Herding is also benefitial many times as rapid propogation of scientific facts needs such behavior ,but it needs constant scrutiny. Herd behavior example 1 : The most typical example is the drug prescribing pattern of anti hypertensive agents over the past half century.The movement from diuretics to beta blocker , from beta blockers to calcium blockers and to ACE inhibitor and again to diuretic , then to ARBs and currently shying strongly away from beta blockers, in between have a brief encounter with alpha blockers and finally back to diuretics. If a particular physician by his insight , had clinged onto diuretics ( Away from the herd ) for over three decades he is a real exemption , although branded old timed and unscientific , he has been the most scientific medical professional indeed ! Herd mentality example 2 : Every one says so ! so it must be true ! Hormone replacement therapy good or bad goes with the leader of the herd . Who is the watch dog , whether science is moving in the correct direction ? Read this land mark article how medical research can be distorted by such learned behavior and how scientific research should not be done . Click on the image . This post is not intended to hurt anyone . It reflects , human beings are not fully evolved yet , in the onging process of evolutionary biology. Normal qrs cardiac failure says goodbye to CRT and CRT says good bye to echocardiography ! CRT , cardiac resynchronisation therapy is being projected as a revolutionary treatment for cardiac failure , where a failing heart is rewired electrically through multiple leads and make it contract more effectively.The success rate of CRT was highly variable.The basic question here is, there should be a significant documentation of desynchronisation prior to CRT , for resynchronisation to be effective. Further , the sites of myocardial stimulation ( Coronary sinus/LV epicardial) , dose of electricity and the sequence of stimulation and the electrical delay are very critical. Achieving this into perfection is not a simple job and is real rocket science ! ( If we can achieve 5 % of what the normal purkinje network do within the LV we can term it a huge success.) Let us hope we catch up with nature . Finally , it is ironical the sites of LV pacing , electrophysiologists select currently is infact not selected by them but pre selected by the patients coronary venous anatomy ! .So as on date , one can imagine how scientific this treatment could be ! Initially it was adviced for patients with only wide qrs later for even normal qrs patients.When people started using it indiscriminately insurance companies started to rethink and thus came the RETHINQ study in NEJM and brought a full stop to CRT in normal qrs CHF. How to identify who will benefit from the costly CRT ? It is a million dollar question. So millions of dollars were spent to identify the correct tool to identify the true responders to CRT.Echo cardiography with sophisticated methods tissue doppler, tissue tracking and , 3 D echo ,velocity vector imaging were done .These methods are not only costly but also time consuming and hugely expertise driven. Does all this efforts with advanced echo techniques worthwhile ? The superior aspect of coronary sinus and a portion of the left atrium share a common wall .Embryological defects in this area result in a communication between left atrium and coronary sinus. This defect descriptively called as unroofed coronary sinus .This entity is most commonly associated with persistent left SVC. 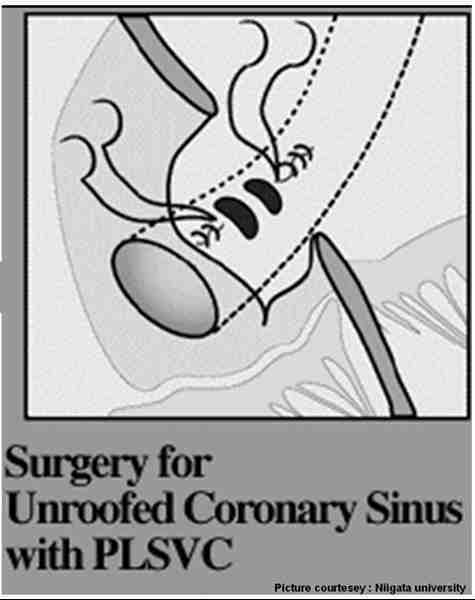 Extreme form of unroofing is some times termed as absent coronary sinus. How to diagnose it ? A high degree of anticipation is necessary in all patients with ASD or LSVC. A dilated coronary sinus in routine echocardiography warrants full investigation. A contrast echocardiography with agitated saline injection in left cubital vein will clinch the diagnosis as contrast enters LA after opacifying the dilated coronary sinus. During right heart catheterisation catheter course entering coronary sinus and advancing into LA through the fenestrations (Unroofing) will confirm the defect. How do you classify unroofed coronary sinus ? What is the clinical relevance of this entity ? This entity should be suspected in every patient with persistent LSVC, ( and LSVC should be suspected in every patient with ASD). 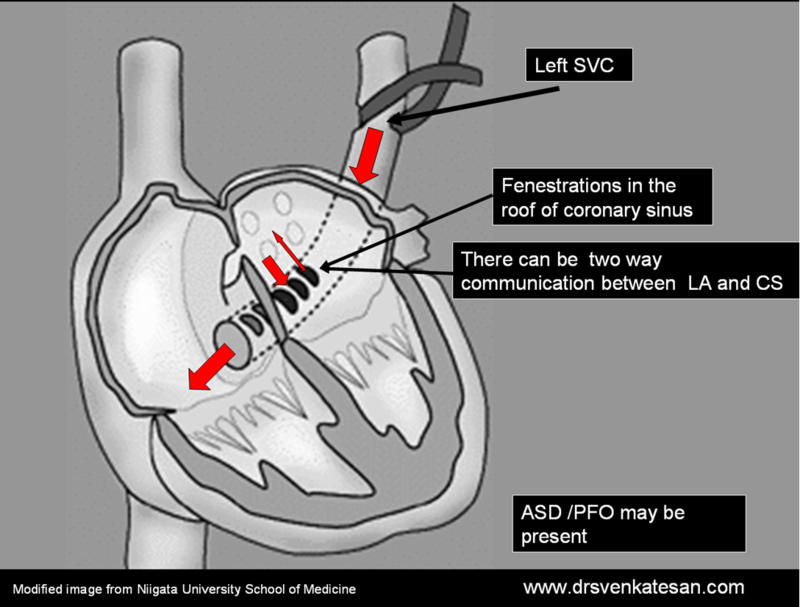 The hemodynamics is that of an ASD but if sufficient mixing of LSVC blood and LA blood takes place the child will have mild cyanosis.Some times when the coronary sinus is totally absent it will present as a typical dusky ASD picture which can closely mimic a TAPVC clinically. Why commerce always prevail over common sense in medicine ? Human civilisation has met so many challenges.Man kind has enjoyed the benefits of modern medicine for over a century.Now comes the new threat.Threat from within.The onslaught of marketing force has contaminated the medical science . It is widely recognised commerce is masquereading as science , from stem cell research to futile and costly drugs, and questionable devices and procedures . How is the medical community responding to this issue ? Silence is the response ! Why silent ? Are we the part of the problem ? Occasional articles in the Annals of medicine, Lancet, BMJ, or JAMA talk about these issues and nothing happens next . Click below to read one such article from the recent issue of Annals ! Let us hope the world financial crisis currently we are witnessing , would be good for human health as all futile market driven , enforced medical expenditure goes bust ! What are the ECG features of NSTEMI ? Non ST elevation Myocardial infarction (NSTEMI) is a major mode of presentation of acute coronary syndrome. Patients present with clinical unstable angina and elevated cardiac enzymes or troponin. ECG features can be any of the following. Bulk of the NSTEMI belong to ST depression group.NSTEMI with purely T wave inversion is less common but occurs mainly in perioperative settings, pre existing CAD.NSTEMI with normal ECG is very rare but can occur.